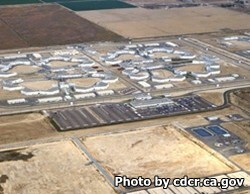 Kern Valley State Prison is located in Delano California. It houses 5000 adult inmates, 4600 of which are level IV High security inmates. Kern Valley has two administrative segregation units and 500 beds in the substance abuse treatment facility. Minimum security inmates are also housed at Kern Valley State Prison, but they are separated from the high security inmates by a lethal electrified fence. Inmates who are serving time at the minimum support facility are eligible to participate in many prison related operational support jobs. These jobs help the prison to run by providing services like cooking, laundry, administration services, warehouse, and maintenance while also giving the inmates a chance to learn a new skill. Once you have completed a visitors application and it has been approved you can visit an inmate. Visiting is on Saturdays and Sundays from 8am-2:30pm, you must arrive prior to 1:30pm to be admitted to visitation. Often many people arrive for visitation and line up at the facility before 6am. If you would like to reduce your wait time you can schedule an appointment, this is not required unless your inmate is in the administrative segregation unit (ASU) or is in orientation. You can schedule a visiting appointment online here.